There's a discussion at Fr Ray Blake's blog about the Church and the poor. I thought this little montage might help some people along in the discussion. Here is one of our 'little treasures' from St Mary Magdalen's parish bringing 'flowers of the rarest' for Our Lady. Well...he said they were the rarest. As if to illustrate Fr Ray's point, I had to cut off the video half-way because he said something pretty offensive. Lord, bless him. Jesus gives us the poor because in the poor He has the power and capacity to change people's lives and empty their bank accounts at the same time since they have the capacity to do both. No wonder we want to keep His poor at arms length! He teaches us to be kind, like He is kind. They teach us to 'beware of avarice of any kind', that 'where your treasure is there your heart shall be also'. They teach us to love without conditions and show us the transience of material possessions. The poor teach us humility and show us the face of Christ crucified, despised and rejected. 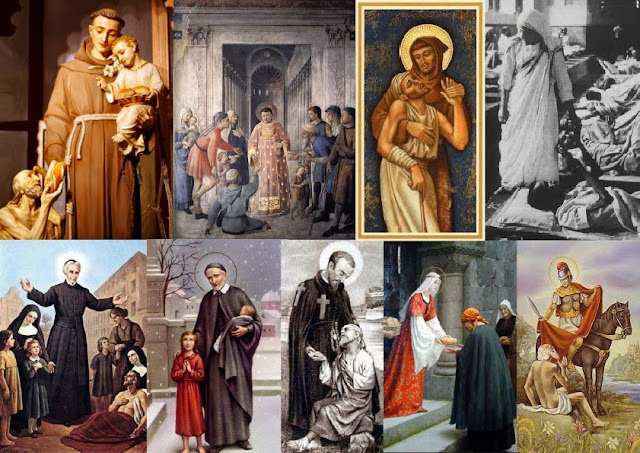 Catholic Saints and Blesseds have always, regardless of time or place, regarded the poor as an opportunity to serve God and a source of countless graces and blessings. The idea that this should be any different in the 21st century is just bonkers. More bonkers than the guy in the video! The image above shows us that if we do not believe this then we are not really traditionalists at all! And anyone who believes the welfare state changed all of this needs a reality check. Lazarus is still at our gate. The conduct of the lives and the love of God shown in their love for the poor and needy reminds us daily that we are or that we should realise that we are mediocre Christians, always wanting to follow Christ 'up to a certain point' - often well short of half-way! What a kinder, more happy, more merciful, more loving, more holy world, holy Church this would be if we put into practice what Our Blessed Lord actually said. Nice discussion-aid, although it may be too subtle for certain folk who are concerned about Fr Blake's "left-leaning" tendencies when it comes to the poor. The very most compassionate thing we can do for the poor is bring them the Faith along with the sandwich. It was always true, but now in our secular states they are not likely to hear it from anyone else. But this we are not doing, our formal charitable outreaches. It is the fault of the false ecumenism of Vatican II. I am trying to practice this charity. I take cheap but good pre-council TAN books to the busiest bus stops, a whole variety. I have a tray like cigarette girls used to carry about, and hand crocheted the strap in brilliant pumpkin. I don't provide the sandwich on these excursions, but do give away the books to those with no donation money. Do you ever do this, Lawrence? "the poor" are not some discrete group of persons, morally or any other way. I'm poor in material things and struggle to buy food, etc. There are much worse forms of poverty. There is a tendency in the piece on Fr Blake's blog to see "the poor" as an entirely other set of people than practising Catholics or those who may read his blog, and to reduce "the poor" to those who beg in public. There are people who are materially poor who are committed, faithful Carholics. And those of us who are materially poor are not more likely to misbehave or dream of interrupting the Holy Sacrifice of the Mass. It is not material poverty but other things that cause a person to behave immorally. Many Catholics at Mass on Sunday go without basic things to support their parish on Sunday, as a priority, and to give to very important works, such as pro-life charities.